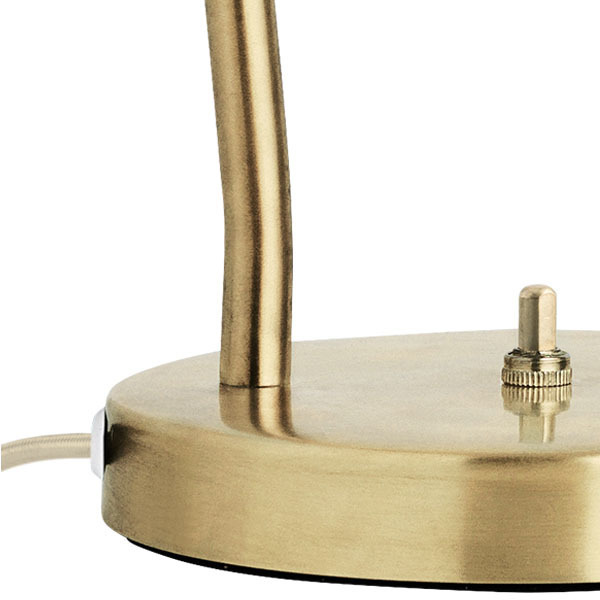 The tubular brass stand of the Gräshoppa table lamp is mounted on a brass base whilst the steel shade is mounted with a moveable joint in solid brass. The light can be directional, yet the glare is minimal. The shade is powder-coated and available in 4 colors: matt white, jet black, anthracite grey and blue-grey. Switch is integrated in the base. Greta Magnusson Grossman (1906–1999) maintained a prolific forty-year career on two continents: Europe and North America. Her achievements were many and include industrial design, interior design and architecture. In 1933, after successfully completing her fellowship at the renowned Konstfack University College of Arts, Crafts and Design, in Stockholm, she opened Studio, a combined store and workshop. During the same year she married the jazz musician Billy Grossman with whom she later emigrated to the United States, settling in Los Angeles. Through the 40’s and 50’s Greta Magnusson Grossman exhibited her designs at museums worldwide, including MoMA in New York and The National Museum in Stockholm. 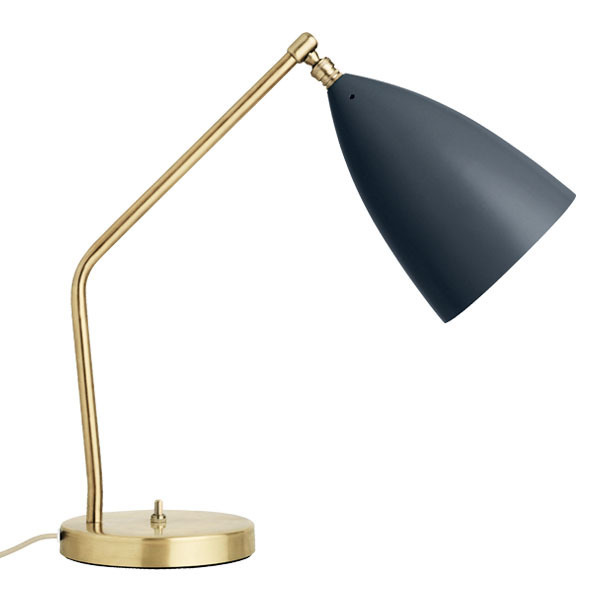 The most iconic products Greta Magnusson Grossman designed in the 40’s and 50’s were the Grasshopper floor lamp and the Cobra floor and table lamps. In 1950, the Cobra lamp won the Good Design Award and was subsequently exhibited at the Good Design Show at the Museum of Modern Art. Greta Magnusson Grossman was highly influenced by European Modernism, which had been imported to the US by influential architects, such as Walter Gropius (founder of the Bauhaus) and Ludwig Mies van der Rohe. Greta Magnusson Grossman, in turn, played a significant role in defining the aesthetic of mid-century Californian Modernism. The iconic Grasshopper lamp was first produced in 1947. 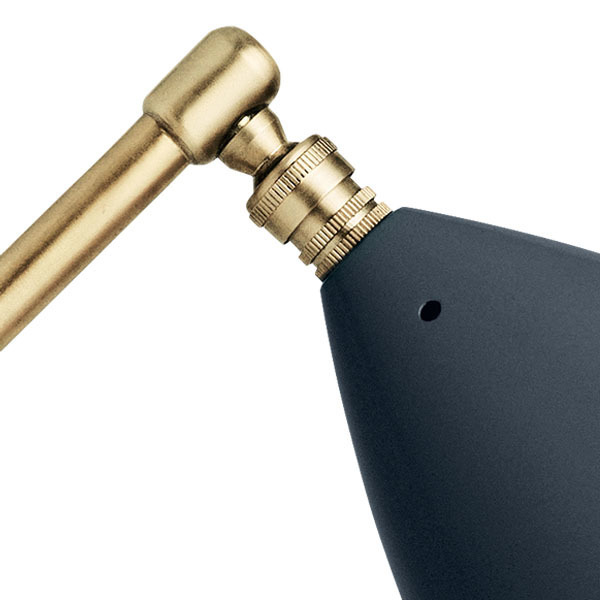 The tubular steel tripod stand is tilted backward and the elongated aluminium conical shade is ball jointed onto the arm, so the light can be directional, yet the glare is minimal. Both stand and shade are powder-coated. Today, Greta Magnusson Grossman’s product designs are highly collectible and are sold at auctions all around the world. Greta Magnusson Grossman’s products are unique, modern classic designs.